Metal body, stainless ultra-polished, hand-assembled. Steel Frame with Anti-Twist Unit Connections, support frame with reinforcements around the group to avoid twisting. Dispenser Unit with High Heat Stability, exclusive dispenser unit with high thermic stability thanks to over 2kg of weight. Steam/water tap with pivoting lever control and jointed stainless steel wands. Incorporated Motor and Positive Displacement Pump, all integrated within the machine. High Precision Gauge with Double Scale, pressure gauge for pump and boiler pressure integrated into one. Reduced Energy Consumption, programmable night cycle: reduces energy consumption. Heat Exchangers Accessible for Inspection, exclusive innovation to provide the control and cleaning of the heat exchangers. Includes 1 x Grey Eureka Zenith 65e On Demand Coffee Grinder and 1 x Stainless Knock Drawer. Heavier duty grinders in a choice of colours are available upon request. The compact coffee maker Sixties is a small espresso machine of very compact dimensions obtained through a design study aimed at containing the overall dimensions. Ideal for bars, restaurants and small cafés. With elegant stainless steel body and a perfect mix of finishes of high quality, valuable metals and maximum reliability. The advanced technology makes you able to obtain a superb quality coffee all day long, giving to your clients the real Italian espresso. 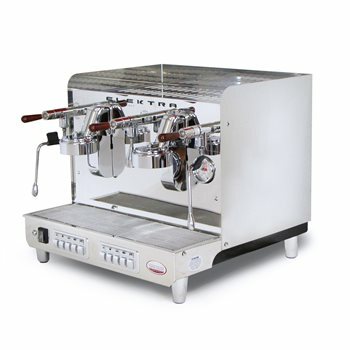 With over 25 years experience within the coffee industry, a team of engineers and a warehouse full of spare parts The Espresso Shop is not only an online coffee/equipment supplier.